Gernetzke was a Wausau native who parlayed a part-time high school job as a radio show host into a broadcast career that lasted more than 44 years. He began in the business as a radio show host at WSAU-AM, Wausau, in 1952. 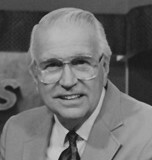 Then, in 1954, he moved into television, joining Wausau’s WSAU-TV, as a weather anchor. He stayed until 1967, when he went to WISN-TV, Milwaukee, where he was their weather anchor for 13 years. With his wife, Rosemary, he co-hosted a noon show for WISN-TV; it began as “Dialing for Dollars” and over the course of a 17-year run evolved into the lively talk and variety show “At 12”. He and Rosemary became affectionately known as “Mr. and Mrs. Milwaukee”, delighting viewers with interviews of local and national newsmakers and celebrities including Milton Berle. He served as spokesman for the Cancer Society and he and Rosemary served as national co-chair-persons for the Muscular Dystrophy Campaign. His career came full circle in 1986 when he returned to hometown Wausau to host a morning show at the station for which he first worked, WSAU-AM, and became become Director of Public Affairs at WSAW-TV, serving once again as Wausau’s ‘weatherman’. Howard Gernetzke passed away on February 6, 1998. Mr. Howard Gernetzke came to mind recently when my brother mentioned that he was watching WSAU TV in northern Wisconsin. As a little girl visiting my aunt in Tomahawk, Wisconsin in the late ’50s and early ’60s, I used to enjoy watching Howard Gernetzke’s weather forecasts. I loved the arrows he drew on the weather map, and I wrote him a letter telling him so, which he read on the air! I remember him very fondly. As a young lad, Howard was my first introduction to a TV weatherman. I have measured all subsequent weatherpersons with Howard and he still heads the list! A true gentleman!